This 6-bedroom villa for up to 11 guests is located in Pals and has a private swimming pool and. 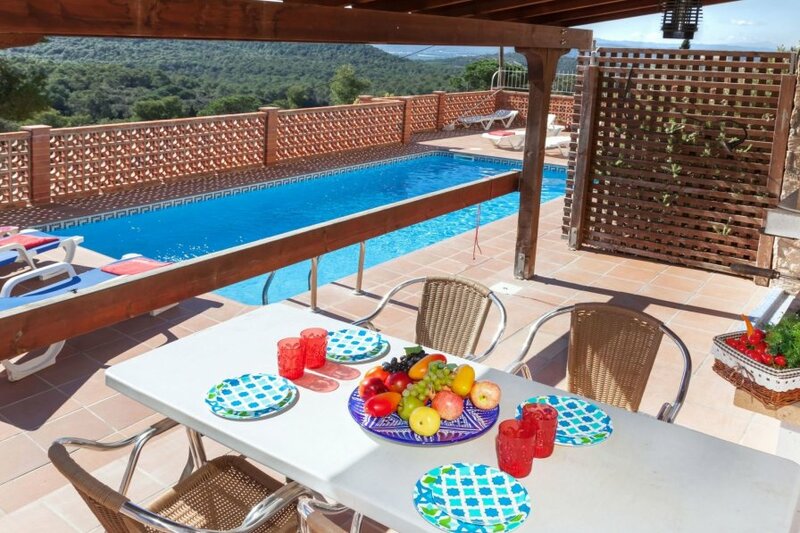 Masos de Pals 3 km from Pals: Cosy, rustic 2-family house El Monte. In the resort, 4 km from the centre Pals, in a quiet, elevated position, 5 km from the sea, 5 km from the beach. Private: terraced garden (fenced) wildlife garden, swimming pool angular (8 x 4 m, depth 110 - 190 cm, 15.04.-15.10.) with internal staircase. Outdoor shower, patio, pergola (45 m2), terrace (13 m2), garden furniture, barbecue. Room cleaning on request (extra). 300 m long gruff motor access to the house. Stepped path (40 steps) to the house. Public parking on the road. Supermarket 1 km, restaurant 2 km, internet cafe 2 km, railway station Flasa 25 km, sandy beach Platja de Pals 3.7 km. Golf course (18 hole) 3.6 km, tennis 2.7 km, minigolf 2 km. Please note: car recommended.